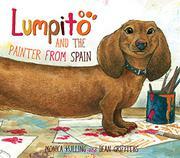 A sweet-natured story about a real little dachshund (lump means “rascal” in German) who won Picasso’s heart. Kulling based this simple picture book on the real-life pet of Life photographer David Duncan. This diminutive dog was dominated by the Duncan’s Afghan, Big Dog. One day, Duncan and Lump (there’s only room for one small dog) motor down to the south of France in a zippy sports car for a shoot of the renowned artist. Picasso and the dog bond immediately, and Duncan decides that the little dog would be happier as part of a bustling household that includes a friendly big dog named Yan and a frisky goat called Esmeralda. Lump soon becomes the painter’s beloved little “Lumpito.” The prolific painter later includes his doggy companion in many works, including his studies of Las Meninas, the famed Diego Velázquez painting of the Spanish court (the original also features a dog in the foreground). Disappointingly, no explanatory backmatter is included to supplement the brief text, missing the opportunity to add much-needed depth and detail to this fascinating and appealing story drawn from fact. Despite the notable textual limitations, Griffiths’ lighthearted paintings charm. In some, the little dachshund seems heroic, nearly life-sized—quite a feat when he is sharing a story about a painter who most agree was himself larger than life.